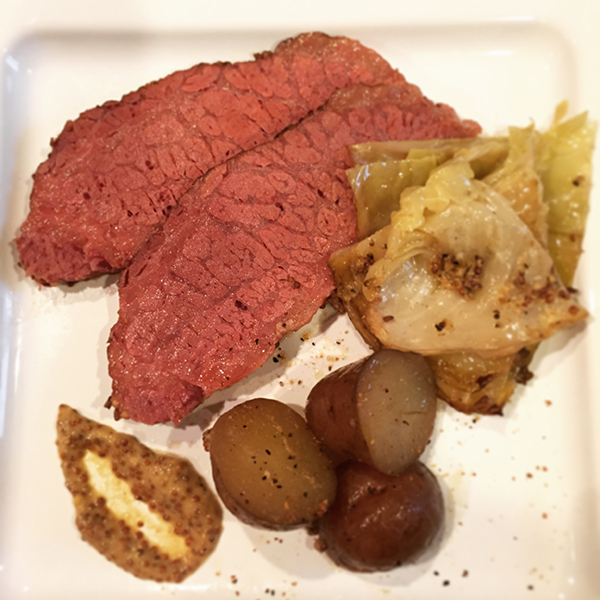 St. Patrick’s Day is right around the corner and a time honored tradition for most is to make corned beef and cabbage for dinner. To be honest I never really was a fan of corned beef, but now looking back I think it was more of how it was prepared than the actual meal itself. This recipe really changed my mind and it is now a household favorite. Remove your corned beef and place into a disposable half pan. Coat your corned beef using a few tablespoons of mustard. If you are not a fan of salt you should first rinse your corned beef under cold running water. 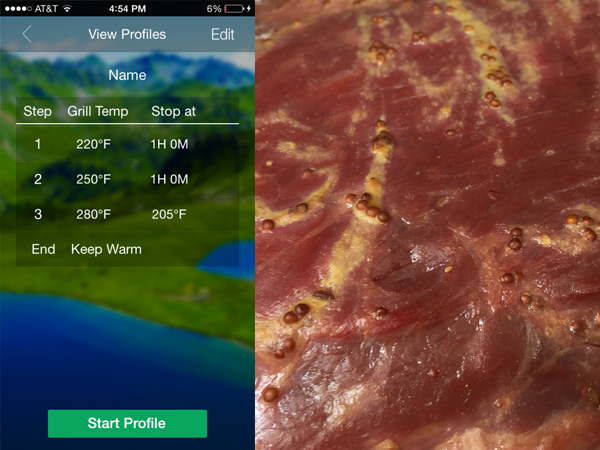 Next, place your corned beef in the smoker for 1 hour at 220f. During this time cut your potato in half and after the first hour place the cut potatoes along the edges of the pan seasoning with garlic salt and pepper. Return to smoker for another hour, turning the smoker up to 250f. The next step is to quarter the cabbage and remove the core and stem. You will also need to melt the butter in the microwave, adding 1 tablespoon of mustard and 1 teaspoon of garlic salt to it. Then Add the cabbage to the pan with the core side facing up to act like bowls, and drizzle them with the melted butter/mustard mix. Cover tightly with foil. Turn your Smoker up to 280f and continue to cook until the internal temperature of the meat hits 205f approximately 2 hours, remove foil cover and continue to cook for 15 min. Slice and enjoy! Cooked a Corned Beef today using your method. 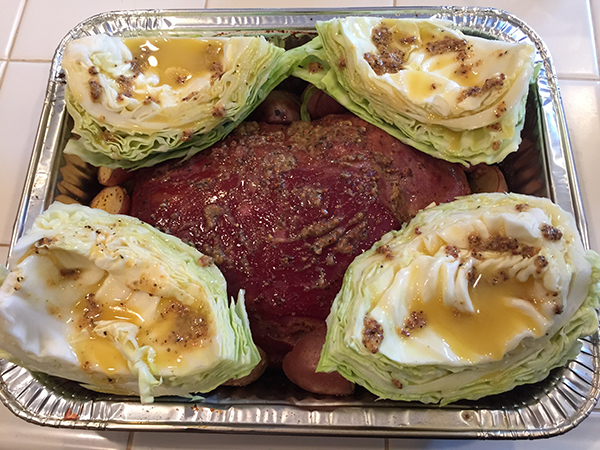 Being a “little” health conscious, we rubbed the cabbage with a mixture of spicy brown mustard and apple juice. This was a fabulous meal! The meat was so moist and tender. 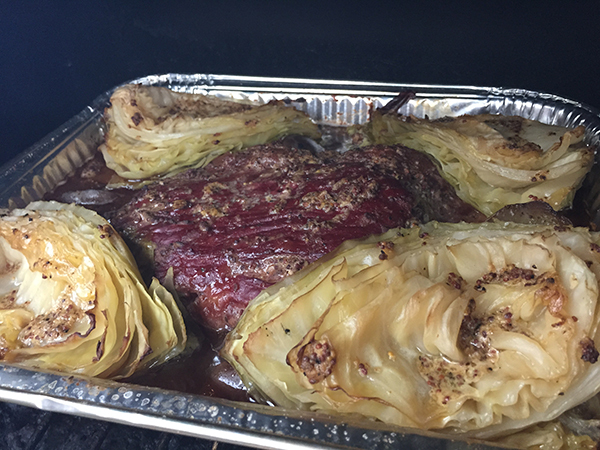 The cabbage absorbed some of the smoke flavor and was very tasty. The potatoes were browned but very moist. Can’t wait to try some more of your recipes!